Paul Merson has suggested Chelsea might be making a mistake with the imminent transfer of Gonzalo Higuain. According to the Evening Standard, a deal to take Higuain from Juventus is close, and Chelsea are working to get the deal done in time for the Argentina international to make his Blues debut against Arsenal in their Premier League clash at the Emirates Stadium this weekend. While Higuain arrives at Stamford Bridge with a fine scoring record in Serie A, this will be his first spell in English football, and it comes at a late stage of his career. 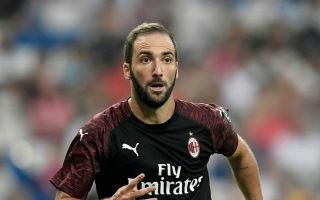 The 31-year-old has not been at his best on loan at AC Milan this season, but he now looks to have been the man chosen to replace Alvaro Morata. This is despite previous links with other strikers who have experience of playing at this level, with the likes of Bournemouth’s Callum Wilson and Leicester City’s Jamie Vardy linked with the club by the Telegraph not so long ago. Merson seems to think someone like that would have been better as he questioned the Higuain signing. ‘I’m not sure on him,’ Merson told Sky Sports. ‘He was a great player but looks below his best of late. He hasn’t pulled up trees for a while and now he’s coming to the hardest league in the world. ‘He won’t have any time to adapt either as he needs to hit the ground running as Chelsea need someone to play as their focal point.